This video shows a worm-like robot simulated in V-REP. The robot is composed by 49 segments and 48 active joints. This video shows V-REP simulating the ACM-R5H snake-like robot. This video shows the simulation of PipeTron, a pipe inspection robot. This video demonstrates the inverse kinematics functionality, the "path" functionality and the "cutting" functionality of V-REP. This video shows how a simulated industrial robot is controlled via a Wiimote device. This video demonstrates the simulation of the Katana robot equipped with a paint nozzle. The paint nozzle disperses color with a gradient (center of the jet slightly brighter). All parameters can be fully customized (color, gradient, dispersion area, density, etc.). V-REP is a robot simulator with a range of functions, features and APIs. The robot simulator V-REP, with integrated development environment, is based on a distributed control architecture: each object/model can be individually controlled via an embedded script, a plugin, a ROS node, a remote API client, or a custom solution. This simulation in V-REP runs without a single line of code. It should be noted that the variations displayed in the pin-cans minimum distance graphs are mainly due to the polygonal nature of the can models. This video shows several functionality of V-REP, but the focus is on the vision sensor functionality: in V-REP a vision sensor is similar to a camera, but many parameters can be adjusted (resolution, what objects are seen, etc.) and filters can be applied: V-REP offers more than 30 built-in filter components that can be combined in any way and that allow processing a vision sensor's image, and extracting useful information (e.g. center of gravity of a color patch, orientation, etc.). This video shows an ABB IRB360 robot playing chess and Tic Tac Toe with three other robots. All 4 robots use image processing (blob detection) to track their opponent's moves. 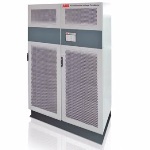 This video shows how the ABB PCS100 AVC (active voltage conditioner) operates effectively. The PCS100 AVC is an inverter-based system designed to protect sensitive industrial and commercial loads from voltage disturbances. Recent developments by researchers at ETH Zurich present three quadrocopters working in co-operation to toss and catch a ball using an elastic net. The video by V-REP shows an ant-like robot walking. The whole control of the robot (as seen in this video) requires less than 200 lines of code, everything included. This video shows two ABB IRB360 robots that perform a pick-and-place task of colored shapes. This video demonstrates the Reflexxes Motion Library type IV, that is integrated in V-REP and fully functional. This video shows two example simulations that use V-REP's path planning calculation module. It allows to define and solve holonomic tasks in 2-6 dimensions, and non-holonomic tasks for car-like vehicles. This video shows V-REP simulating the Expliner robot. Expliner (which is commercially available from Hibot Corporation) is able to inspect very high power lines while power is on, and also manages to overcome spacers and other obstacles on its way. The Expliner CAD model is courtesy of Hibot Corporation. In this simulation a YouBot robot solves the problem of the tower of Hanoi (using cubes instead of discs however). This video reveals how the PCS100 RPC (reactive power conditioner), available from ABB, improves the power quality of the Wellington cable car system in New Zealand. The system reduces the risk of resonance problems, prevents costly outcomes due to poor factor or harmonics, ensures correct functioning of rectifier loads by fixing voltage unbalance, and lowers maintenance costs. This video displays how the power protection solution from ABB has saved Fonterra’s time and money by reducing the production downtime at its Takanini milk production facility located in Auckland, New Zealand.